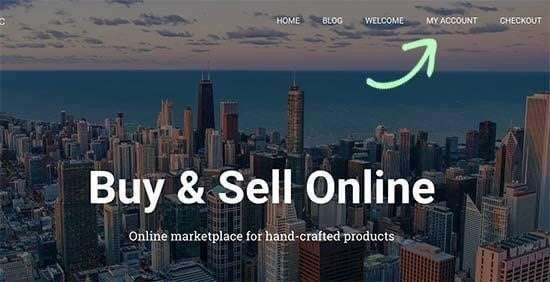 Although the great variety of existing marketplace platforms such as Amazon, eBay, Esty, and more are there, creating your own one is a good idea. 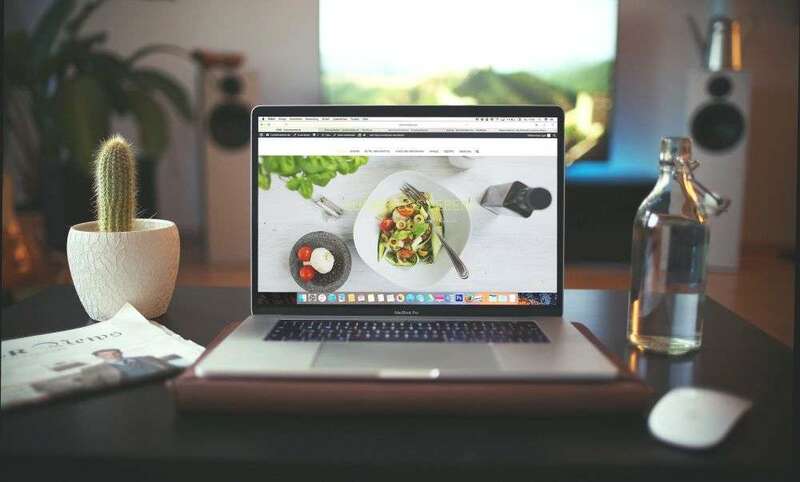 According to Juniper Research, the growth of the online marketplace economy led by sharing economy companies is predicted to two-fold by 2022. The research simply shows that the growth of the online marketplace is not going to slow down in the coming years. Isn’t that a good reason to give it a try? This blog post explains everything you need to create a marketplace website and ensure its smooth operation. The blog has chosen WordPress platform to create an online marketplace website. Why WordPress is a Good Choice? 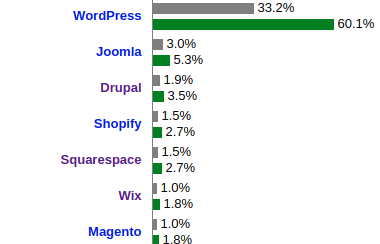 WordPress is the most dominant Content Management System (CMS) on the market. According to W3tech, WordPress is used by 33.2% of all websites across the web whereas its CMS market share is 60.1% – more than of all other CMS systems combined. In addition to this, WordPress has a large community that has been evolving continuously. You can raise any of your WordPress-related query here and expect quick answers from experts. There are some other WordPress communities that organize WordCamps for users of all skill levels. So you can join them to learn how to use WordPress better. The biggest reason WordPress has become a household name is that it is free to download, install and use. Moreover, it is user and SEO friendly too. To start with creating a marketplace website, your first step is buying a domain name and web hosting account. Don’t go with any random web hosting service as you need to host a WooCommerce website. Do enough research about the services of your potential hosting providers. If this is not feasible for you, read out a hosting review test post that reviews speed, uptime and other features of leading hosting providers. Speaking of pricing, a domain name should cost you between $10 to $14.99/ (for .com extension). For a premium web hosting plan you should expect to pay between $2.99/mo to 7.99/mo. Whereas SSL certificate may cost you between $50.12 to $ 69.99/ year. Once you are done with purchasing hosting service, domain name, and an SSL certificate, you will need to install WordPress and create a WooCommerce store. With most hosting providers, you will find a one-click WordPress installation option in their control panel. If you don’t find such an option, you can go for Famous 5-minute install. Decide the look of your website and choose the theme accordingly. With WordPress, you have the option to choose between free and premium theme. Storefront and Child themes are optimized for WooCommerce, so you can try them. It is quite straightforward. Download the WooCommerce plugin from here and go to your website. Access WP Dashboard->Plugins->Add New->Upload. Next, choose the downloaded plugin and then click on Install and then Activate. 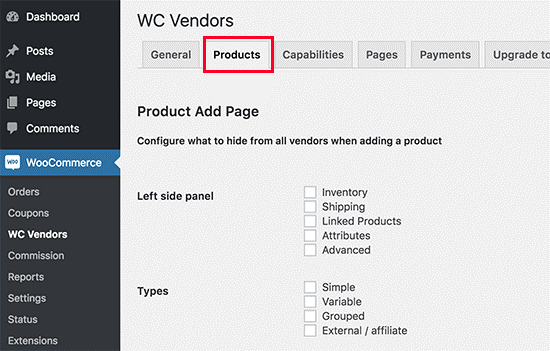 By default, WooCommerce assumes that your site is a single vendor website. It will not be possible for your users to add their own products until you convert it into an online marketplace platform. Let’s find out how to do that. Download WC Vendor Plugin to your computer. Log in to your WP admin area. Go to Plugins->Add New. Browse to the plugin and select it. 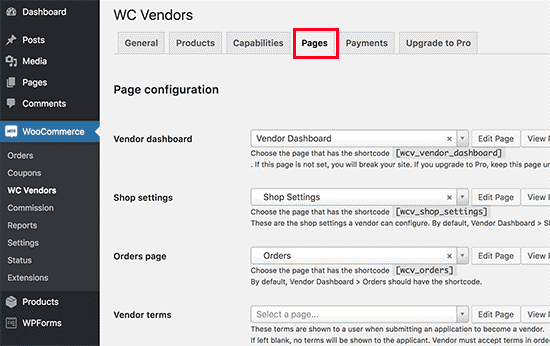 After activation, you have to go to WooCommerce-> WC Vendors page to configure marketplace settings. Here, you have to set a commission rate for your vendors. Don’t worry, you always have an option to override the rate later on for individual products and vendors. Review the page carefully and make the changes as needed. Click on the “Save General Changes” button to store your settings. Next, move to the Products page. Here you can choose the items you want to hide from your vendors. 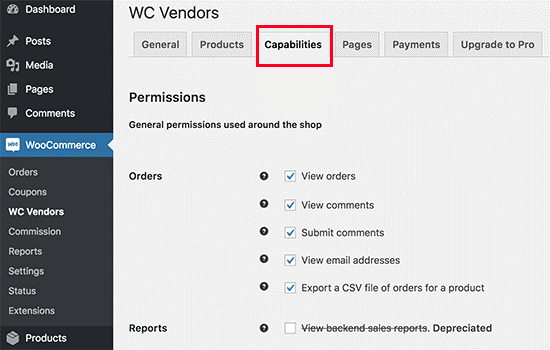 The plugin WC Vendors also allow you to set up vendor permissions and capabilities. Now go to the settings pages Pages. 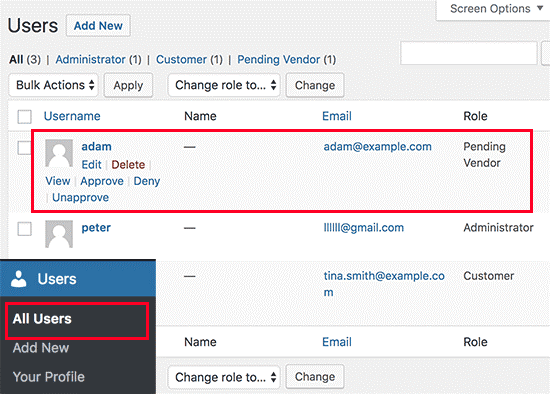 The plugin automatically creates pages for vendor dashboard, orders page, and shop settings. However, the one page which is not created automatically is the Terms page. This is the page that your vendors have to agree on when submitting their application. To create a term page, you will have to create a new page in WordPress and write terms and conditions in plain text. You should clearly describe what vendors can sell, how they will get paid and how they can settle disputes if any. After creating a term page, you will need to return back to this section and choose your newly built page. The final setting on the page is quite important. 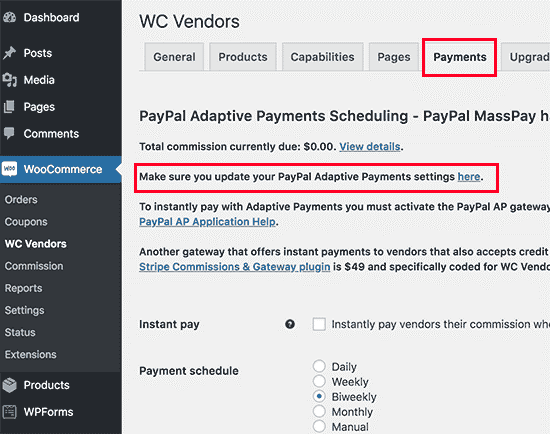 By default, WC Vendors comes with PayPal Adaptive Payment options. Here you will find a link to set up your PayPal adaptive payment. 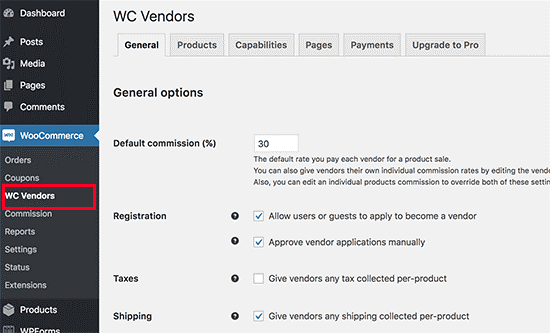 Now you’re done with your WC Vendors settings and you can move to WooCommerce setting to make it ready for a multi-vendor environment. The next step to create a marketplace website is enabling account management in WooCommerce. 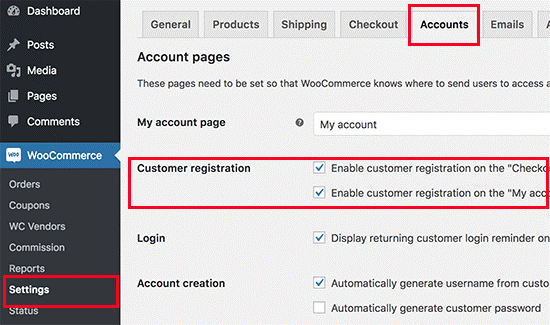 For the same, first, you need to go to WooCommerce->Settings page and hit the “Accounts” tab. Next, you need to check the boxes available in front of customer registration options. Once the multi-vendor marketplace setup is finished. Make it easy for vendors to use your website. Go to Appearance-> Menus page. 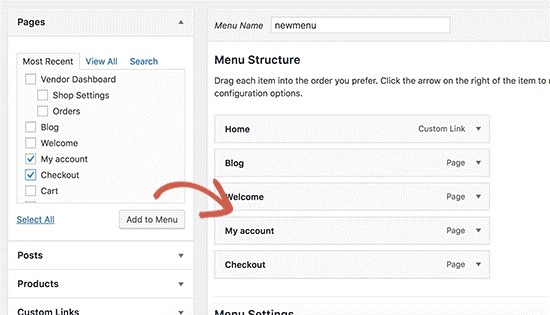 Add your user account and checkout pages to the navigation menu. Set up all the navigation menus according to your needs and then click on the “Save Menu” button to store your changes. In case you don’t find My Account page, you can create a new page in WordPress by adding the following shortcode in the post editor. Before you make your marketplace website available to your vendors, test it personally. Open your website in a new browser window and create a new account by clicking on My Account. This option allows customers and vendors to create their accounts. As soon as you create a new account, you receive an email notification. You should also check out new vendor applications by visiting Users->All Users page. New vendor requests are shown as ‘pending vendor’. You can approve or disapprove them by clicking on the links available under the usernames. 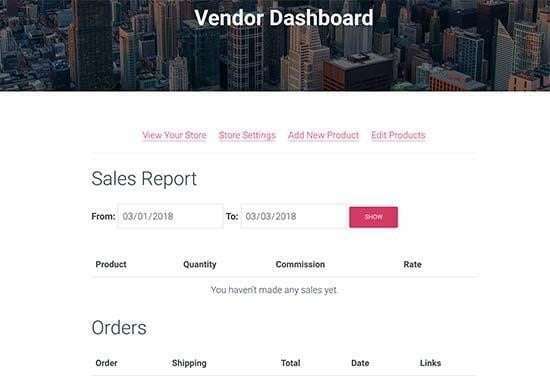 Once you approve these requests, vendors will be able to log in to their accounts and add products on their dashboards. Here, vendors can also have a look at their orders and sales reports. 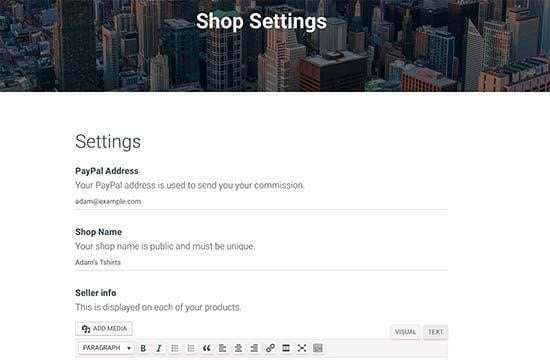 To set up their shop, the very first thing your vendors have to do is, click on ‘Store Settings’ link. Vendors will have to provide their PayPal email address to receive payments. After that, they can add their shop name and description. Whenever vendors add their products, you get a notification email. Now your shop page will show the products sold by your different vendors. You can approve and delete these products according to your choice. Once you have set up your online maketplace site, it is time to launch it. Don’t expect your marketplace to grow in a day. It may take years for a marketplace to get going. Before you officially launch it, craft some pre-launch teasers to capture the attention of potential buyers. Be patient and constantly try new things to promote it. You should come up with a specific marketplace niche. Remember, successful marketplaces are successful because they preferred to start with one particular niche. In the beginning, focus on the minimum viable product. Since you are in the early phase now, you don’t have to serve millions of consumers. You should focus on creating a marketplace website that your vendors believe in. Don’t forget to focus on the outcome of your marketplace website. You should ask yourself what are you aiming at? The goal of your marketplace website should be connecting merchants and customers within the niche to sell products and services. Also, measure the success of your marketplace. Look for the tools that can help you know monthly active users, time spent on site, bounce rate, etc. So, these are a few important things that you need to follow to create a successful marketplace website. See also: How to convert PSD design to WordPress? Rick is an expert marketing specialist by day and a powerhouse content publisher by night. His top 3 hobbies include reading tech-related books, traveling and listening to podcasts about philosophy.